Did the Freeze Kill My Palms? 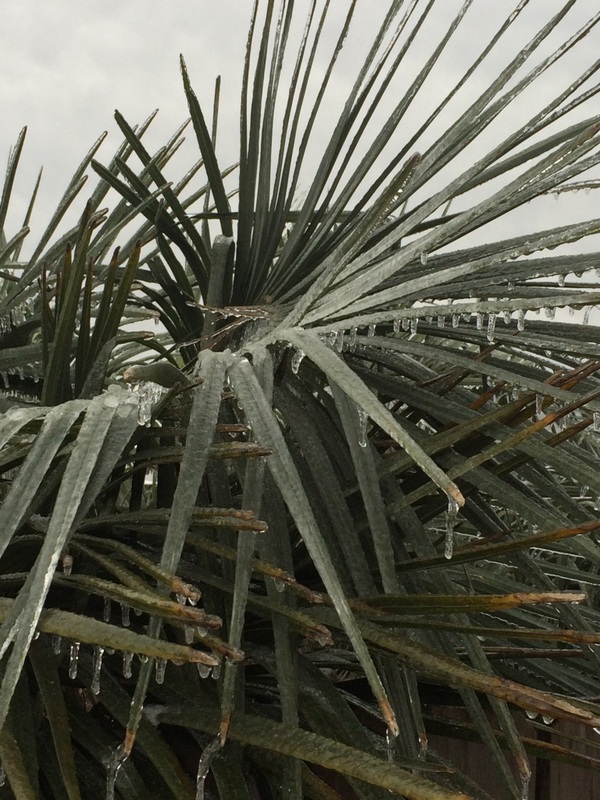 Icy pindo palm. Photo by Mary Derrick UF IFAS. The best approach is to leave the palm alone until all danger of frost or freeze is past. Avoid the temptation to remove any of the dead fronds; they will help insulate and protect the meristem, or bud, that will produce new shoots. If the palm is not too tall, in the spring check to see if the spear leaf (the newest frond that usually stands straight up and has not opened) can be easily pulled out. If the spear leaf does not pull out, the likelihood that the palm has survived is good. Don’t despair if the spear leaf does pull out as the meristem below it may still survive. The best strategy in that event is to remove the dead spear leaf and treat the bud area below the spear leaf with a copper fungicide to reduce the chance of infection of the bud. Be sure to use a copper fungicide and not a copper fertilizer, like copper sulfate. Once spring comes and you find that the palms have survived, don’t be alarmed if the first new frond is deformed or has dead tips. The fronds that follow will most likely be normal. The palm will be building its depleted food reserves with new leaves so do not remove any fronds that have any green on them whatsoever. All green tissue is making food for the palm and helping it to recover from the cold stress. Only remove fronds that have completely died and have no green tissue. When temperatures warm and the palms are actively growing, apply a palm fertilizer with the formulation of 8-2-12-4 with micronutrients. This week, Northwest Florida is once again receiving some bitter cold temperatures. 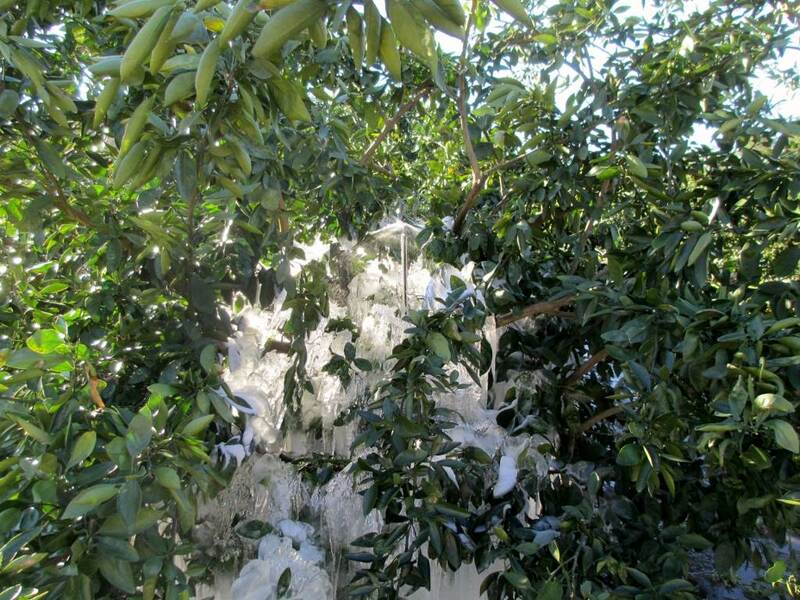 The freezing weather two weeks ago resulted in some cold damage to some local citrus trees. Cold injured citrus trees can take a while to become evident. What appears to be damage will not always be permanent. Never be in a hurry to remove cold injured tissue from a citrus tree. Citrus, especially Satsuma, can be very resilient and will often re-sprout on injured tissue. Pruning before this can happen can remove fruit producing branches. 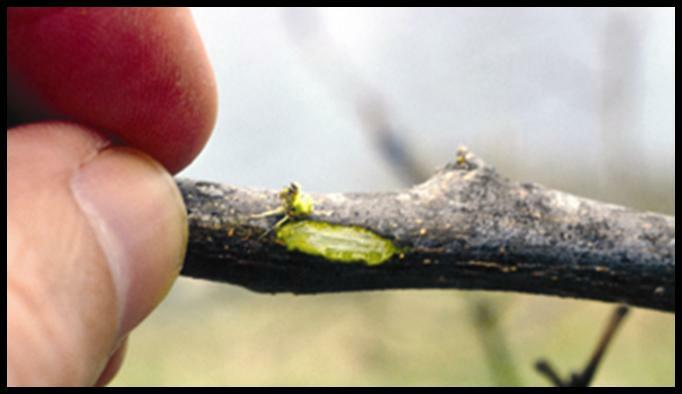 Leaves on a freeze-damaged citrus tree will be hard and brittle. 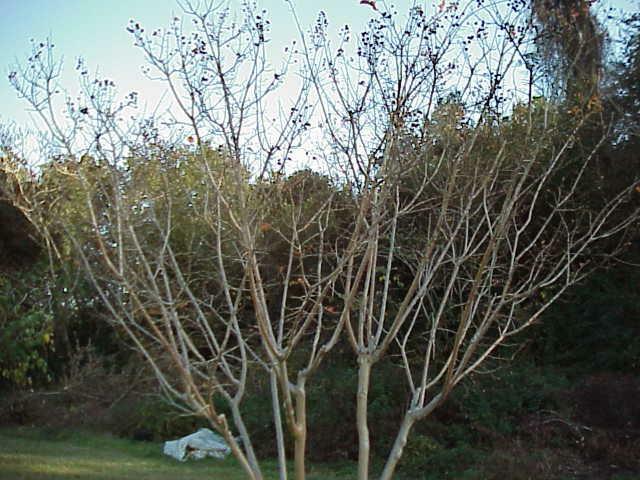 If freeze damage is severe, the leaves will collapse, dry out and fall from the tree. 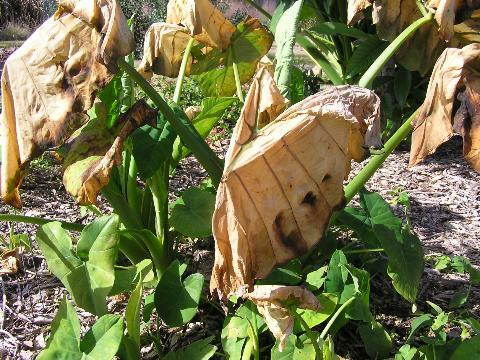 It’s normal for leaves to take on a wilted or drooping appearance during periods of low temperatures. Don’t confuse this with freeze damage. Frozen leaves will not be wilted – they will be hard and brittle. Freeze damage can also cause the trunk and larger branches to split and the bark to become loose. Twigs and branches may continue to die for up to two years following a severe freeze. Unless the soil becomes dry, be careful to not water cold injured citrus trees during warm periods that often follow freezes. This will delay the tree’s growth and keep the tree in a more dormant state. However, it is important to not let citrus trees go totally dry, because this will increase freeze damage. Later on, if you see that the damaged tree is putting on new growth, it’s okay to give it a little water. It is best to not prune or fertilize citrus trees during fall and winter.Delay pruning of damaged limbs until late spring or summer because it’s difficult to determine the extent of damage until spring growth takes place. Pruning also may encourage new tender growth during the cold season. If it appears that you’ve lost half the tree in a freeze, you’ll only need to apply about half as much fertilizer. If you have the situation where many leaves were lost but twigs and branches were not injured, you’ll need to slightly increase the amount of fertilizer. Fertilization should begin after new growth has occurred come spring. It’s a good idea to make frequent light applications rather than one heavy application. Fertilizing your lawn during fall and winter may not only be damaging to your lawn but it can potentially cause cold injury to your citrus trees, as well. The roots on trees (including citrus) extend two to three times beyond the tree’s branches. As a result, citrus tree roots grow out into the lawn. Tree roots in the lawn are shallow. So, late applications of lawn fertilizer will impact your citrus trees as well. Your lawn and citrus needs ample time to use the fertilizer but yet still have time to go dormant before cold weather arrives. 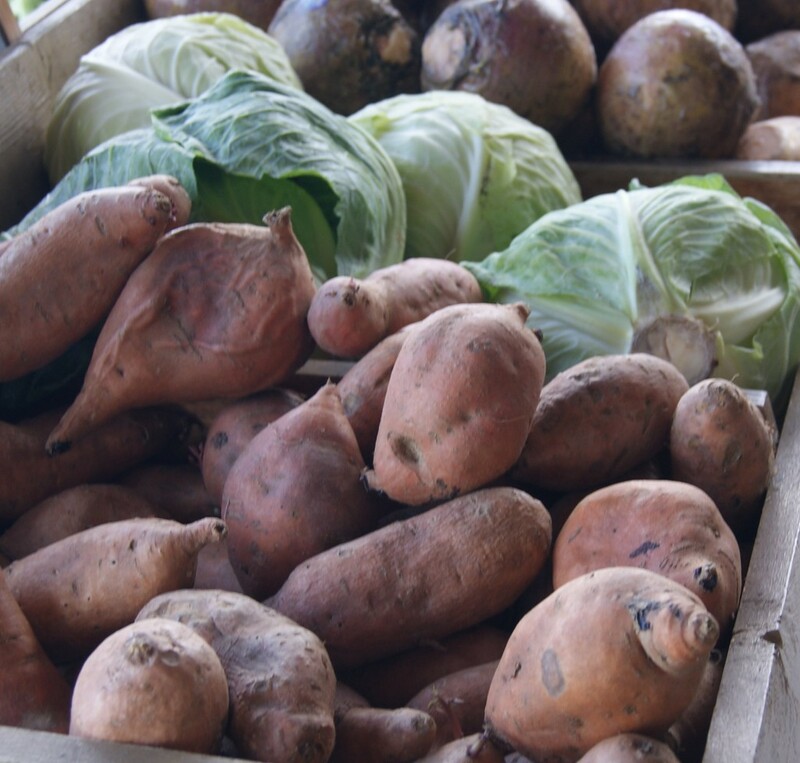 Every winter, many Florida homeowners enjoy growing their own vegetable plants. It is definitely cheaper to buy vegetable seeds than vegetable transplants, and some vegetables grow better when direct seeded. One factor to take into consideration when planning a vegetable garden is that each vegetable has a different germination response to temperature. Some seeds germinate best under low soil temperature while other respond best under high soil temperatures. When planting vegetable seeds, remember that cool season crops, such as cabbage, turnips, and cauliflower, will perform best under cooler soil conditions. The key to getting the highest seed germination rate is to match the correct soil temperature to the vegetable seed of choice. Below is a listing of correct soil temperatures needed for vegetable seed germination. 95​-Cucumber, Muskmelon, Okra, Pumpkin, Squash, and Watermelon. January and February are typically the coldest months in Florida and plants can be damaged by low temperatures. But with your help, cold-damaged plants can often recover. After a freeze, see if your plants are dry. Even injured plants need water. Plants, however can be greatly damaged if the temperature drops suddenly. They have no time to acclimate to the freezing temperatures. Plants are damaged when ice crystals form the plant cells. The crystals expand, rupturing the cell walls and preventing the plants from maintaining shape. If severe, this can kill tender plants. On hardier plants, damaged foliage will appear wilted and curled down. In a few hours or days, it will darken and turn black. Flowers and buds my die, blacken, and drop to the ground if exposed to cold temperatures. Damaged flowers will not develop into fruit. Young branches and new growth are especially susceptible and may also blacken and die. After freezing temperatures occur, remove damaged leaves and flowers as soon as they turn brown or black. This will help prevent diseases from attacking the plant. Pruning should be postponed until cold temperatures are no longer expected and new growth begins to appear on the plant. This is to make sure that live wood, which appears dead from losing its leaves, is not mistakenly removed from the plant. 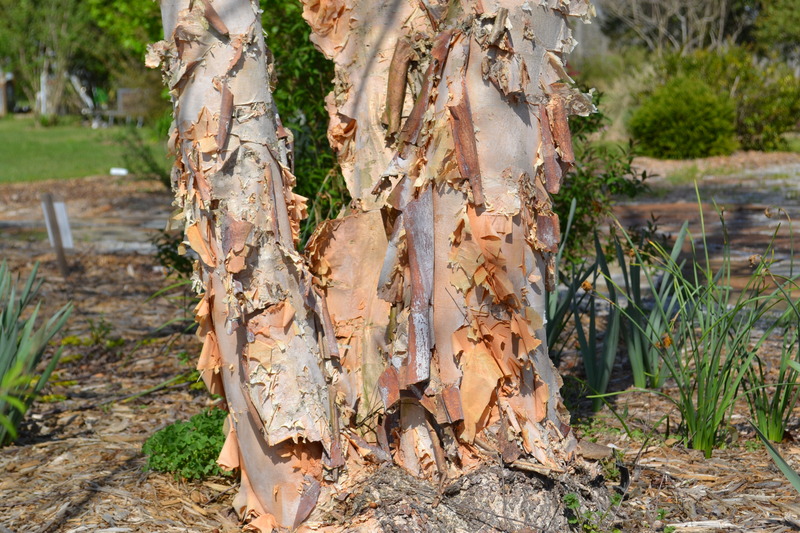 Cold damaged wood can be detected by examining the cambium layer (under the bark) of the plant. If it has black or brown discoloration, it is damaged and should be pruned back behind those points. Protect your plants from cold temperatures during the next cold front. Do this by moving potted plants indoors and covering tender landscape plants with a protective covering. Protective covering can include old bed sheet, pieces of material or fabric, and cardboard boxes. Be careful not to let the protective covering touch the plants. The surface of the covering will become as cold as the air temperatures and may damage any tender leaves it come in contact with. Also, don’t forget to remove the covering the next day when temperature raises this is important so the plants do not “bake” in the warmer temperatures. Plants placed near the house, lights, or other structures, which shelter them from wind, will be more protected than those fully exposed to the cold air. Whatever you do, even if your landscape ornamentals have already suffered some cold injury. Do not relax your guard more frigid weather may be on the way. So, be prepared to keep your prized plants, as warm as possible, each time the weatherman predicts freezing temperatures. Plants should be fertilized in the spring, to encourage new growth. Try not encouraging any new growth, until all frost danger has passed. Landscape Design–Now is the Time to Start! Most people associate yard work with the spring and summer, but if you’re considering a major redesign of a home landscape, now is a great time to start. Without the vegetation on deciduous trees, it’s easy to see the “bones” of your yard—the tree trunks and branches, sidewalks, and fences—which frame it. One of the best ways to start with landscape design is a piece of paper and pencil. If you’ve got a paper copy of your survey, even better—you can sketch in trees, sidewalks, and fences with an aerial view and see where the open spots lie. Take some time to walk around your yard, considering how you use the space. Do you have children or pets that need room to run? A shady area for relaxing? Full sun for a garden? All of these uses can co-exist in a single yard, but the key to good landscape design is allowing for them to flow together in a logical, attractive way. If you’ve never put together a comprehensive landscape design before, there are several very helpful tools online provided by horticulture experts with UF IFAS Extension. The “pattern guide” is ideal for starting and completing small projects, such as side yards, shade areas, etc. and even suggests appropriate plants based on light conditions and region of the state. Using this guide is a great way to start from scratch and build up to a diverse, healthy landscape. On the other hand, if you are essentially satisfied with your yard but just need a few accent plants or another tree somewhere, a great online resource is http://floridayards.org/. Here, you can enter a set of specific criteria based on the type of plants you’re looking for, and the site will create a customized list of suggestions to use in your landscape. 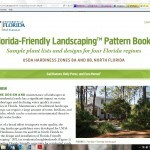 The online Florida-friendly landscaping pattern book has great ideas for redesigning your landscape. After deciding on additional needs for hardscape and plantings, the next step is to make room for them by removing sod or unwanted landscape plants. Now is also the time to look at irrigation needs—if you have an existing system, make sure it still works with your new landscape design. If it doesn’t, it’s much better to redirect water, piping, or add new sprinkler heads while you’re digging into the soil than after you’ve finished installing new vegetation. If you aren’t using an irrigation contractor, you’ll need a solid understanding of how the system is set up before making changes. Inexpensive kits can also be purchased to add drip or micro-irrigation to an already-installed system. Once irrigation and hardscape are complete, you can begin with plant installation. It makes the most sense to plant trees first, add mulch around the root zone, then put in shrubs and groundcovers based on your plan. Many do-it-yourselfers will take their time on this step, adding new plants as time and budget allow. This method works well and can be a fascinating way to watch your yard transform. 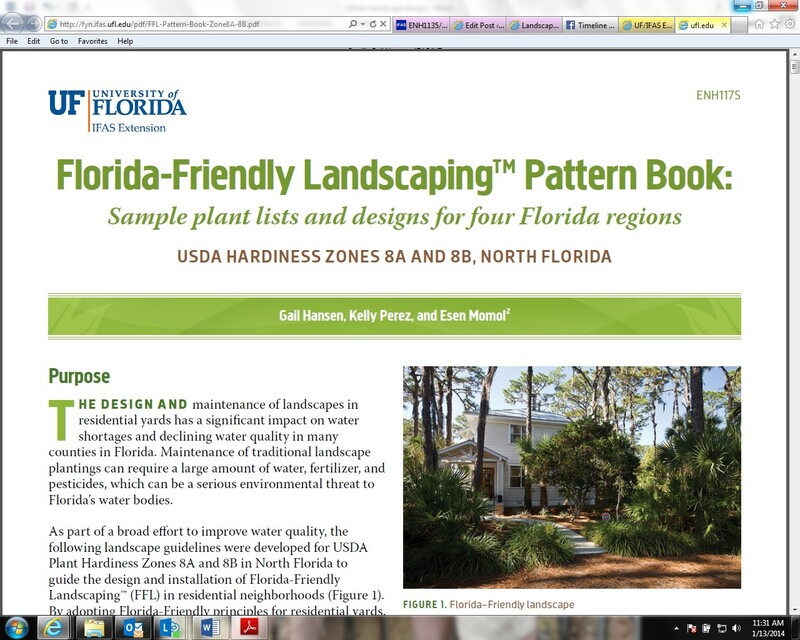 We have many great resources for more in-depth discussion of landscape design and irrigation work, including your local UF IFAS Extension office. Don’t hesitate to call us with questions or send photos of your new and improved yards! On the night of January 6-7th 2014 Northwest Florida was hit with a major freeze event. While many areas reached 18 º F, the West Florida Research & Education Center near Jay reached 14 º F. Similar freezing temperatures are predicted for the night of January 7-8. Water: Your best friend is water because well watered soil retains more heat, and a well watered plant has less chance of drying out during an advective freeze (freeze caused by cold air mass, with wind). Move containerized plants indoors, especially tropical or subtropical plants, annuals or herbs. Containerized woody ornamental shrubs can be left outside, but place them in a sheltered area or south-facing side of a structure. When covering sensitive plants, including row covers for vegetable gardens, the covers should extend to the ground. This allows the heat from the soil to radiate within the covered area. Light bulbs or strings of lights help extend the protection covered plants. Be sure to remove covers when temperatures warm, since covers will trap excessive heat during warm periods. After the freeze event, water the plant well. Plants lose water through transpiration after freeze events and may not be able to take up water as readily if root damage occurred. This will also help thaw the soil of exposed containerized plants. Generally, satsuma are cold tolerant down to 15° F, but young trees or trees yet to achieve dormancy are usually only tolerant to 26°F. Fruit should not sustain damage from freezing temperatures above 25°F. In fact, temperatures between 25°F and 35°F enhance the sweetness of the fruit. Extreme winds sometimes make the effects of freeze events worse if the trees are not well watered. A well hydrated tree is a well protected tree. On the whole, still nights make for worse freeze events since cold air will “settle” into low areas. Wrap the trunk with commercial tree wrap or mound soil around the base of the tree up to 2 feet. This will protect the graft of the young tree. Thus, if the branches freeze the graft union will be protected. For established citrus trees, mound soil around the tree in a cone formation. Do not mulch the trees over the winter since heat that radiates up from the soil will be blocked somewhat by mulch. Young trees (those under 6 feet tall) can be covered the tree with a cloth sheet or blanket. For additional protection, large bulb Christmas lights can be placed around the branches of the tree. This will increase the temperature under the cover by several degrees. Be sure to use outdoor lights and outdoor extension cords to avoid the potential of fire. Always remember to remove cold protection once the temperature rises so that the trees do not overheat. Do not cover trees with plastic tarp, these will not protect the tree and can “cook” the tree once the sun comes out. Water citrus trees. Well watered trees have increased cold hardiness. Do not over-water. If the ground is moist, it is not necessary to water. Frames may be installed around young trees to hold the cover. This option keeps the blanket or sheet from weighing down the branches. Micro-irrigation is an option. This practice will protect citrus trees up to 5 feet, but must be running throughout the entire freeze event. It needs to be turned on at 36ºF and left on until the temperature reached 42 ºF. If the tree is too large for complete coverage, the emitter should be located on the windy side of the tree. Be sure that the water covers the graft union, since most trees will recover from any freeze if the union is not damaged. For additional information read this publication on micro-sprinkler irrigation. Kumquats are the most cold tolerant citrus type grown in Northwest Florida, so protection of fruit is not required unless freeze events reach 20°F. Established tree can withstand colder temperatures without protection. For additional information, contact your local extension office.